Review by AllTheBestFights.com: 2018-08-04, boring fight between Peter Quillin and J’Leon Love: it gets one stars! The former Wbo Mw champion Peter Quillin entered this fight with a pro record of 33-1-1 (23 knockouts) and he is ranked as the No.29 super middleweight in the world. He lost to Daniel Jacobs in 2015 (Daniel Jacobs vs Peter Quillin) but he came back to win in 2017 with Dashon Johnson. His opponent, J’Leon Love, has an official boxing record of 24-1-1 (13 knockouts) and he entered as the No.31 in the same weight class. He suffered his only loss when he faced Rogelio Medina in 2014 (J’Leon Love vs Rogelio Medina) since then he has collected six victories and one draw (with Abraham Han in 2017). 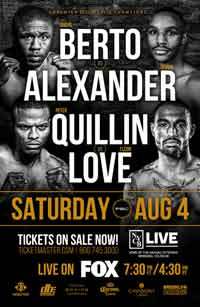 Quillin vs Love is on the undercard of Andre Berto vs Devon Alexander. Watch the video and rate this fight! Review by AllTheBestFights.com: 2015-12-05, great start between Peter Quillin and Daniel Jacobs: it gets three stars. Daniel Jacobs entered this fight with a record of 30-1-0 (27 KOs=90%) and he is ranked as the No.5 middleweight in the world (currently the #1 in this division is Saul ‘Canelo’ Alvarez). He suffered his only loss when he faced Dmitry Pirog in 2010, since then he has won ten consecutive bouts beating Sergio Mora in his last one (=Daniel Jacobs vs Sergio Mora). His opponent, the former Wbo Mw champion Peter Quillin, has a boxing record of 32-0-1 (23 knockouts) and he entered as the No.3 in the same weight class. He has fought twice in 2015 drawing with Andy Lee (=Lee vs Quillin) and winning over Michael Zerafa (=Quillin vs Zerafa). 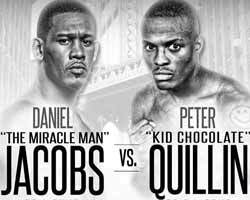 Jacobs vs Quillin is valid for the WBA World middleweight title. Watch the video and rate this fight! Review by AllTheBestFights.com: 2015-09-12, good exchanges with a spectacular finish: Peter Quillin vs Michael Zerafa gets three stars. 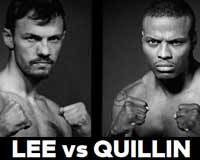 The former Wbo Mw champion Peter Quillin entered this fight with a professional boxing record of 31-0-1 (22 knockouts) and he is ranked as the No.3 middleweight in the world (currently the #1 in this division is Gennady Golovkin) but he comes off the draw against Andy Lee (=Lee vs Quillin). His opponent, Michael Zerafa, has an official record of 17-1-0 (9 knockouts) and he entered as the No.88 in the same weight class. He suffered his only loss in 2014 when he faced Arif Magomedov, after this bout he has won twice beating Bruno Carvalho and Yodmongkol Singmanasak. 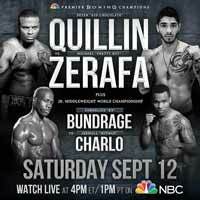 Quillin vs Zerafa is the main event of the evening. Watch the video and rate this fight! Review by AllTheBestFights.com: 2015-04-11, close fight with some nice exchanges but sometimes also boring, however, Andy Lee vs Peter Quillin gets three stars. Andy Lee entered this fight with a pro boxing record of 34-2-0 (24 knockouts) and he is ranked as the No.6 middleweight in the world (currently the #1 in this division is Gennady Golovkin). The last time he lost was in 2012 when he faced Julio Cesar Chavez Jr (=Chavez Jr vs Lee), since then he has won six consecutive bouts winning the vacant WBO Mw title in his last fight, against Matt Korobov (=Korobov vs Lee). His opponent, the undefeated Peter Quillin, has a perfect record of 31-0-0 (22 knockouts) and he entered as the No.3 in the same weight class. He won the Wbo Mw title in 2012, against Hassan N’Dam N’Jikam (=N’Dam vs Quillin) and then defended his belt three times, the last one with Lukas Konecny (=Quillin vs Konecny). Quillin vs Lee was scheduled as a middleweight bout but Quillin weighed in 0,6 pounds over the limit of 160 lbs making the bout a non-title fight; undercard of Danny Garcia vs Lamont Peterson. Watch the video and rate this fight! Review: 2014-04-19, disappointing fight between Peter Quillin and Lukas Konecny: it gets two stars. The undefeated Peter Quillin entered this fight with a perfect record of 30-0-0 (22 knockouts) and he is ranked as the No.4 middleweight in the world, he fought twice in 2013 defeating Fernando Guerrero (=Quillin vs Guerrero) and Gabriel Rosado (=Quillin vs Rosado), in both fights he successfully defended his Wbo Mw title. His opponent, Lukas Konecny, has a record of 50-4-0 (23 knockouts) and he entered as the No.14 in the same weight class (currently the #1 in this division is Sergio ‘Maravilla’ Martinez), he had also a very good amateur career winning 250 fights (25 losses) and two bronze medal at World amateur championships in 1997 and 1999. He suffered his last defeat in 2012 when he faced Zaurbek Baysangurov in a fight valid for the WBO light middleweight title (=Baysangurov vs Konecny), after that bout he moved up in weight class to the Mw division winning the WBO European belt against Karim Achour (=Konecny vs Achour) and successfully defended the title against Moez Fhima. Quillin vs Konecny is valid for the WBO middleweight title (Quillin’s third defense); undercard of Bernard Hopkins vs Beibut Shumenov. Watch the video and rate this fight! Review: 2013-10-26, we were expecting something more from this fight: Peter Quillin vs Gabriel Rosado gets two stars. The undefeated Peter Quillin (29-0-0, 21 KOs) entered as the No.3 middleweight in the world while Gabriel Rosado (21-6-0, 13 KOs) entered as the No.14 (currently the #1 in this weight division is Sergio ‘Maravilla’ Martinez). Quillin vs Rosado is valid for the WBO middleweight title (Quillin’s second defense); undercard of Bernard Hopkins vs Karo Murat. Watch the video! 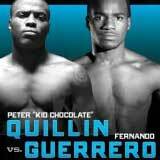 Review: 2013-04-27, exciting fight with four knockdowns: Peter Quillin vs Fernando Guerrero is close to get four stars. The undefeated Peter Quillin (28-0-0- 20 KOs) entered as the No.4 middleweight in the world while Fernando Guerrero (25-1-0, 19 KOs) entered as the No.26. Quillin vs Guerrero is valid for the WBO middleweight title (Quillin’s first defense); undercard of Danny Garcia vs Zab Judah. Watch the video! Review: 2012-10-20, very spectacular fight with six knockdowns: Hassan N’Dam N’Jikam vs Peter Quillin is close to get four stars. Both undefeated and with the same perfect record 27-0-0, the French-Cameroonian Hassan N’Dam N’Jikam (17 victories coming by way of knockout) entered as the No.6 middleweight in the world while Peter Quillin (20 victories coming by way of knockout) entered as the No.9. N’Jikam vs Quillin is valid for the WBO middleweight title (N’Jikam’s first defense); undercard of Danny Garcia vs Erik Morales 2. Watch the video! Review: 2012-06-02, nice fight with one knockdown in the fifth round: three stars for Peter Quillin vs Ronald Wright (fight ended by unanimous decision). The undefeated Peter Quillin ranked as the No.9 middleweight in the world, entered the fight with a record of 26-0-0 while Ronald “Winky” Wright had a record of 51-5-1 (Wright is not ranked as he hasn’t fought since April 11, 2009 when he was defeated by Paul Williams). Wright vs Quillin is on the undercard of Antonio Tarver vs Lateef Kayode. Watch the video!